Playtonic & Team 17’s debut’s their game on the shelves, a kind of game we do not get often in this generation of consoles. Yooka laylee a 3d platformer that gives us a flashback to the 90’s to Banjo Kazooie, Mario 64 and Conkers bad fur day; which would make sense because it has been developed by some former employees of the hit company Rare. Does team 17’s debut game hold up today or should it have been left in the past? let’s find out. 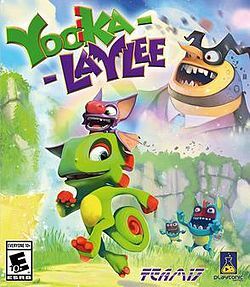 Story: You play as a lizard named Yooka and bat named Laylee, who are out to collect 145 golden pages that have been scattered throughout the five worlds; and this is all thanks to the evil Capital B and his lackey Dr. Quack as they try to make money from all the world’s books and keep the money for themselves. Gameplay: Yooka laylee has a very resembling gameplay to the Banjo-Kazooie series, during your adventure you will run, jump solve puzzles, defeat enemies and complete numerous tasks to collect all the pagies they are known as in each world. During the course of the game, you will run into trouser snake to buy more moves from which will help you in your journey to take down capital B. Conclusion: There is a thing or two that is lackluster when it comes to a game being released in this generation. There is no talking in the game the characters just make wierd noises, back in the 90’s that was ok and acceptable but now it just seems very strange to do. Yooka laylee is a very colorful, fun platforming adventure game that brings back a flash from the past, it is a game that is not meant to be beaten in a few days it will take time to collect everything. Playtonic and Team 17’s debut game it’s the nostalgic heart with that sense of being a gamer in the 90’s again. To Buy or Rent Yooka laylee go to Gameaccess.ca Canada’s largest and number one video game rental service.